In the past few offseasons, the Atlanta Braves have been pretty open about their rebuilding efforts. However, the team’s mindset shifted greatly this winter. It wasn’t too long ago that the Atlanta Braves were on nothing but a firesale. Trading key piece after key piece with the hope that one day, this effort to “tank” would lead the franchise back into long-term contention. For every Craig Kimbrel, Jason Heyward, Andrelton Simmons, Melvin Upton Jr., Alex Wood and Cameron Maybin sent away in a deal, the Braves were hoping that the talent they got back, and the potential high draft picks would build a solid foundation for the future. When longtime MLB personnel man and MLB Network analyst, John Hart, was named as the Vice President of Baseball Operations in the winter of 2014, Braves fans new that there was going to be some losing ahead. However, after a few seasons of sitting at the bottom of the league’s standings, it seems like the Braves are ready to start using their resources to start contending again. Rebuilding efforts don’t all follow the same path, but it is starting to become clear that the Braves are making significant progress. After some great moves to build the talent on the roster and in the minors, there is legitimate hope that Atlanta will see a playoff squad in the near future. A couple of decisions last year allowed the process to move forward. Trading for the likes of Dansby Swanson, Ender Inciarte and Aaron Blair in exchange for Shelby Miller certainly helped. The Matt Kemp trade infused some much needed veteran leadership into a very young team. Still, the Braves recognized that they needed to continue to add veterans if they hoped to move the needle along, Atlanta struggled last season mostly due to their lack of inexperience in its starting rotation. Youngsters Matt Wisler, Aaron Blair and to a lesser extent Mike Foltynewicz all showed that they may have been a little rushed to the majors. With that in mind, the Braves’ braintrust acted on improving their pitching staff. 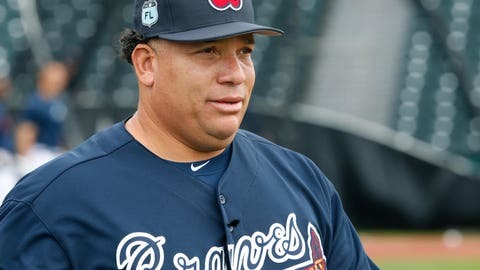 Atlanta targeted veteran hurlers early in free agency by brining in Bartolo Colon and R.A. Dickey on one-year contracts for a combined $20 million. They also were able to acquire former St. Louis Cardinals left Jaime Garcia for a couple of non-consequential prospects. This created a major turnover in the team’s starting rotation as the group went from extremely inexperienced to flashing years of solid production. These moves also don’t hinder the team’s ability to reload next offseason as all three pitchers will be free agents next year. However, it was a trade this past week that really opened my eyes about where the Braves think they are in its path to become a perennial playoff team. After the team learned that utility man Sean Rodriguez would likely be out for the year after being injured in a car crash, the Braves almost immediately pulled the trigger on a deal for longtime Cincinnati Reds second baseman Brandon Phillips. Phillips, 35, had previously rejected a trade last winter, but ultimately recognized that the Reds are moving in a different direction. Certainly not the player that he once was, the veteran middle infielder is still a good fielder and hit for a .291 batting average in 2016. Just the swiftness of the move should open the rest of the league’s eyes to how Atlanta views themselves. His inclusion in the Braves lineup adds another veteran who probably is looking to win as his career continues to wind down. This mix of young and old is one you normally see when a team is ready to break out of its cellar dwelling. Along with the older additions, the Braves also have many younger players to look forward to seeing at some point in the next two years. Ozzie Albeis may be blocked by Phillips at this point, but he close to contributing at the major league level. Top pitching prospect Sean Newcomb is also set to open the season at Triple-A, and is probably on track to make his MLB debut once some of the Braves veteran pitchers depart after this season. This roster is possibly the most interesting in all of baseball just because of the old and young dynamic. These veteran additions should help with the progression of many of the club’s younger players. It may be a little too much to expect that the Braves actually make the postseason in 2017, but they certainly are set to break out of being the punchline of the National League. Save that for the likes of the Phillies, Padres and Reds. Fans of the team should be excited by the moves that their organization made this offseason because it signals that they make more aggressive moves to compete in the future. What do you think of the what the Braves did this winter? Let us know in the comment section below.